World’s Most Advanced Minimally Invasive Prostate Cancer Treatment – Robotic Prostate Surgery. Minimally-invasive Robotic surgery for early stage Prostate Cancer is performed with greater precision and has great advatages like reduced length of stay in the hospital, less complications, minimal bleeding and minimal postoperative pain. With our Robotic Surgery system, the surgical team can remove prostate more quickly and accurately than using conventional surgery, with minimal risk and side-effects. 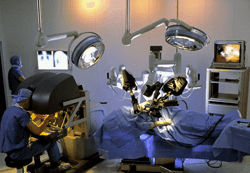 Benefits of robotic surgery versus open surgery are many. Its ‘keyhole’ nature means the procedure is less invasive, less painful and there is 80% less blood loss. The recovery time is much faster – treatment is a day or overnight case versus a week in hospital and months of recuperation and there are fewer side effects such as incontinence. Robotic prostate cancer surgery system is able to provide superior clinical prostate cancer treatment results when compared to non-robotic traditional and scope-assisted procedures. With smaller incisions, the postoperative pain is significantly less, which means your length of hospitalization is shorter – as is the time to return to usual activity. Patients’ need for postoperative pain medicine and narcotics is also greatly reduced after the laparoscopic/robotic approach compared to open surgery. The third advantage of robotic surgery over open surgery is a reduction in the required postoperative catheterization time. The fourth advantage of robotic prostatectomy is the improved ability to preserve the erectile nerves. During an open prostatectomy through an incision on the anterior abdominal wall, the nerves that provide erection are hidden behind the prostate. The approach taken using the surgical robot, enters the abdomen and the robotic arms are positioned posterior to the prostate with the nerves directly in front of the robotic/laparoscopic camera. In this way, the nerves maybe preserved, primarily because the anatomy can be seen more clearly compared to open surgery. This procedure is highly technical. Therefore It is recommended that this procedure be performed by Urologic Surgeon trained in Oncologic surgery with extensive Laparoscopic and robotic surgical experience. What is Da Vinci Master Slave Robotic System? 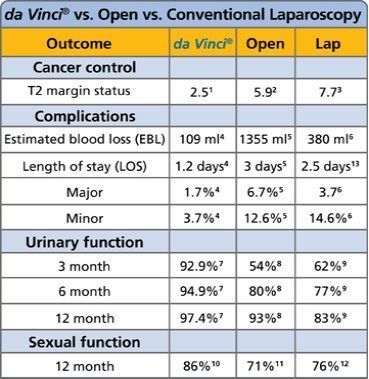 Da Vinci master slave robotic system is used to completely eradicate cancer with minimal side effects for treating Prostate Cancer. Through this system a minimally invasive robot assisted radical prostatectomy technique has been developed in which doctors evolved a unique sequence of surgical steps. Please do watch this video. A recent Robotic Surgery patient from Zimbabwe shares his experience about treatment at our hospital in India. He had multiple co morbidities- diabetes, blood pressure, obesity with BMI more than 35 and obstructive sleep apnoea. Despite all these medical conditions, he underwent successful robotic radical prostatectomy with pelvic lymph node dissection. This video was shot 9 days after Robotic Surgery. Foley catheter out, his biopsy report confirmed that he is now cancer free. He was earlier planning to go to South Africa but the cost was prohibitive. The cost was 1/3rd the cost of South Africa in India and the surgeon had a tremendous experience so he decided to come to India for Robotic radical prostatectomy. The earlier techniques to removal of prostate cancer revolved around simple prostatectomy or radical prostatectomy. Simple prostatectomy is a surgery done to remove a part of the prostate gland in benign conditions such as benign prostate hyperplasia. Radical prostatectomy involves removal of the entire prostate gland including the vas deferens and the seminal vesicles. This is generally done in case of malignant cases where the cancer has spread beyond the prostate gland and into the pelvic cavity. All the lymph nodes in the surrounding area are also removed in an attempt to restrict the spread of cancer. Both these techniques require a long incision in the lower part of the abdomen or the perineum to access the prostate gland. I had just celebrated my 57th birthday and I began experiencing difficulty in urination. During the check-up, I was diagnosed with enlarged prostate with possible cancerous involvement, much to my dismay. I searched online for a good place to have my surgery done and found SafeMedTrip website amongst several others. I sent e-mails with all my reports to this site.